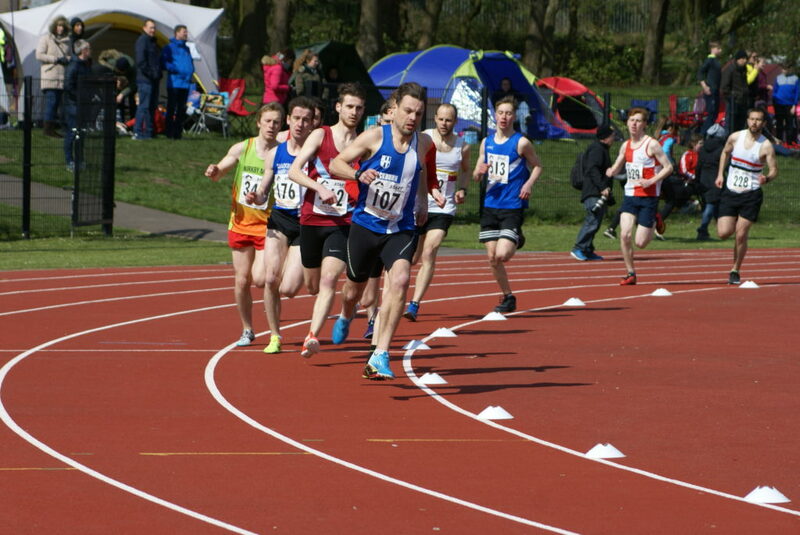 The first fixture in this years Mid Lancs T&F League took place at the weekend, on a windy and cool day at Witton Park Arena which didn’t deter a very good turn out of athletes from the affiliated Clubs. 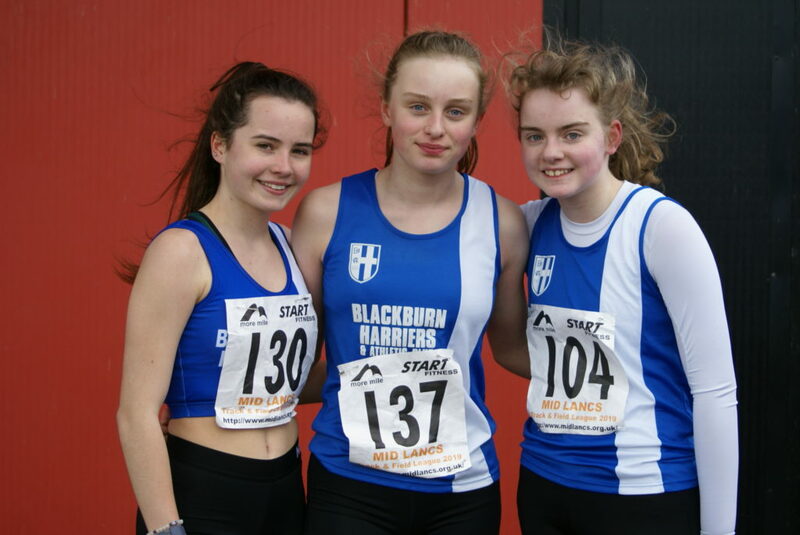 Blackburn Harriers had a very good turn out of their own – over 60 athletes, especially with a number of athletes involved in training sessions at home and abroad, who were looking to see how their winter training transformed into actual performances at the first track and field fixture of the season finishing up with 14 Wins and 20 new PB’s. 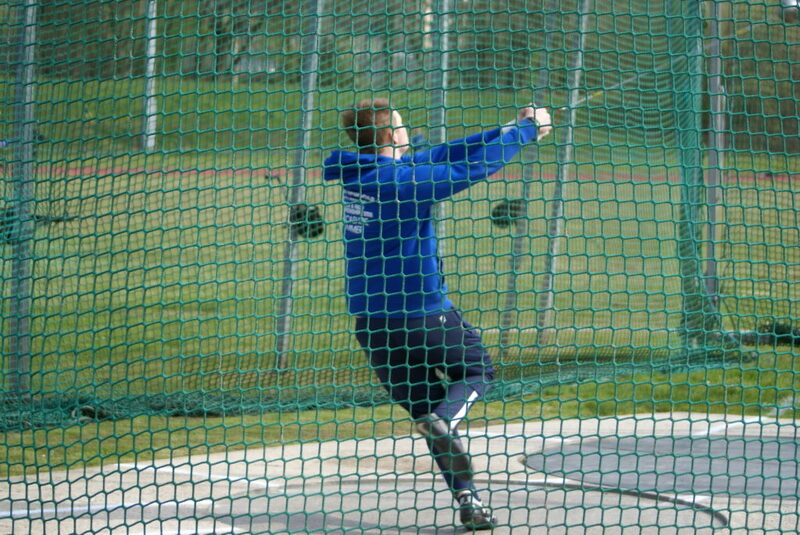 Nathan Billington got his season off to a very good start with a new PB of 41.06m in winning the Senior Men’s Hammer – an improvement of a metre and a half. 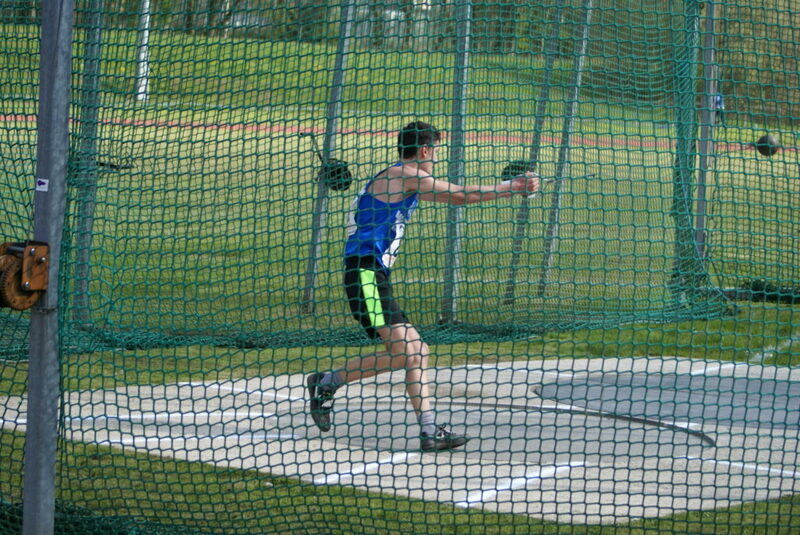 Matthew Heywood – in his first season as an U17 – got off to a flyer with a new PB of 48.07m with the 5kg weight, bettering his previous best by two metres in winning the event. 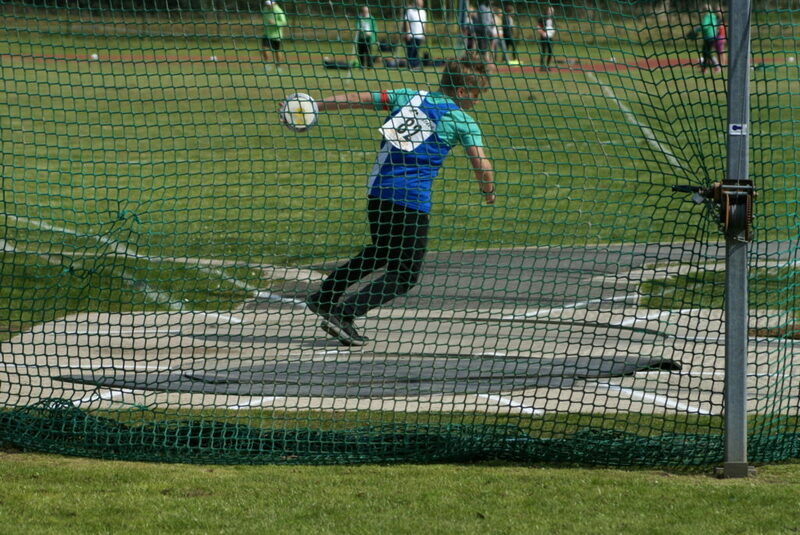 He backed that up with another new PB in the Discus, adding 40cms, of 29.46m (2nd) and finished off with a 3rd placed distance of 7.79m in the Shot Putt. 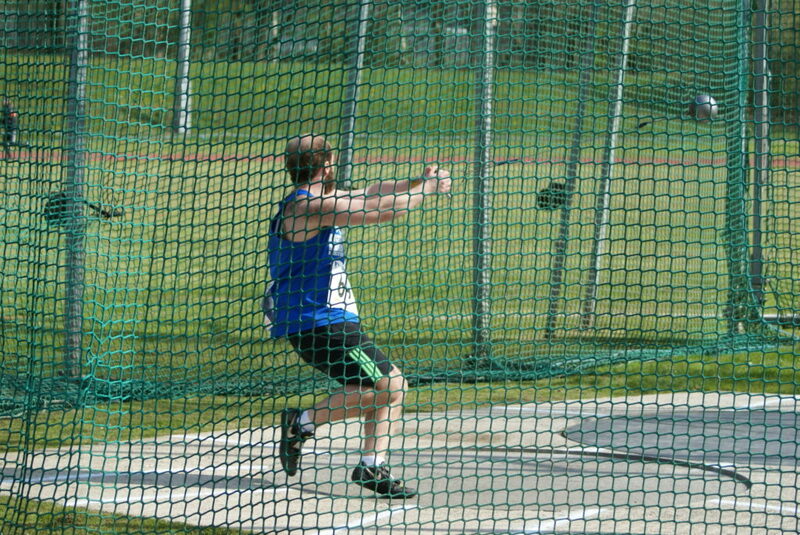 Keiran Carroll (U17) also set a new PB in the Discus by a metre in placing 3rd with 26.03m and set another new PB in the Javelin with a throw of 31.27m. 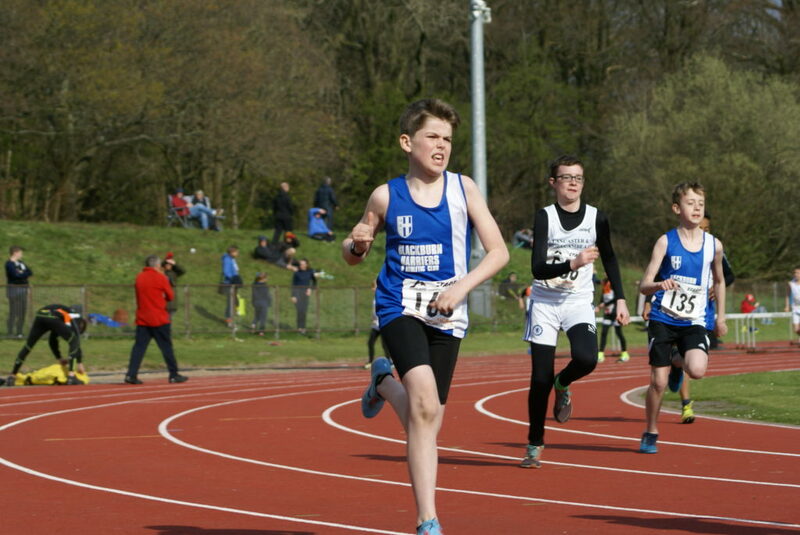 U15 Sebastian Burton was trying the Hammer for the first time ever, coming in 3rd with 6.76m. 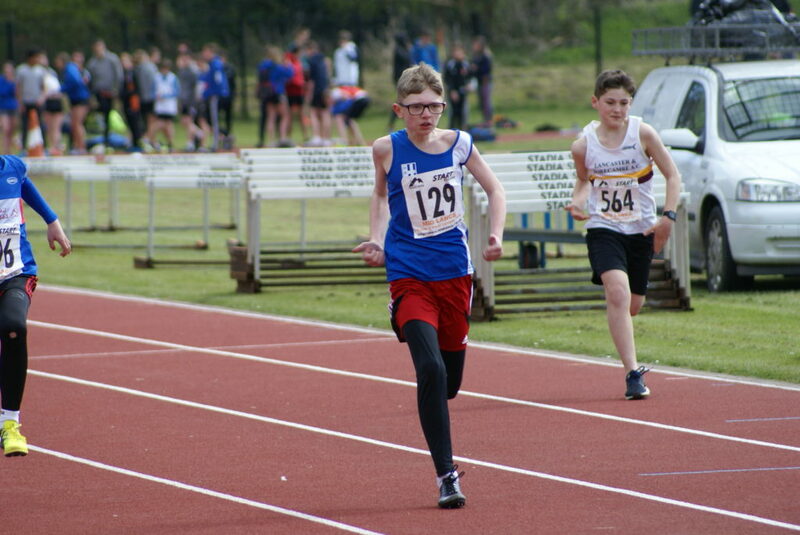 Amongst the U13 Boys Throws – Findlay Carroll had a go at the Javelin for the first time and managed a distance of 10.77m (6th) and in his first year as an U13 – Toby Mansfield finished 3rd in the Shot Putt with 5.58m. 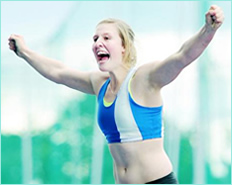 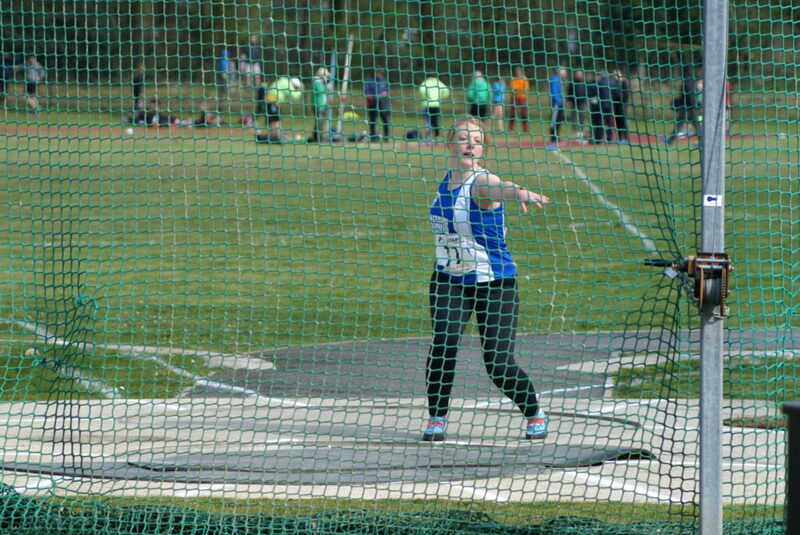 The Women’s Throws saw Anna Peers open up her season with a 2nd placed effort of 9.83m in the Shot Putt, won the Discus with 35.26m and the Javelin with 37.45m. 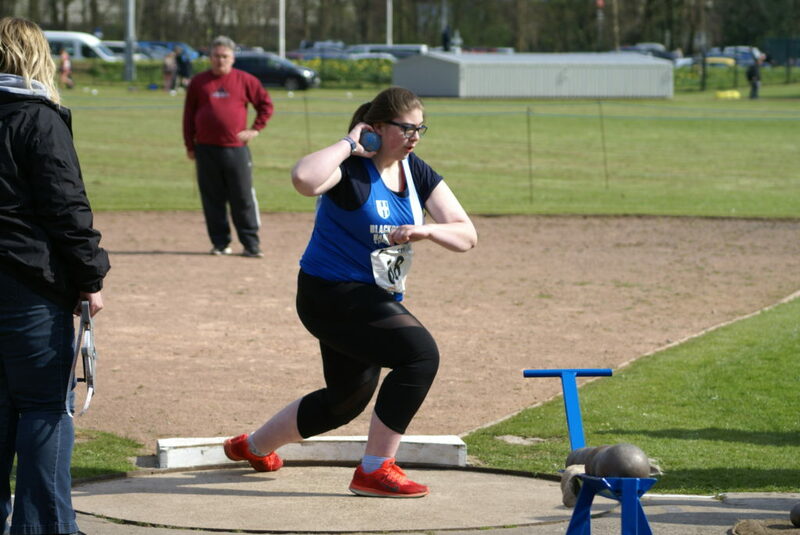 U20 Abigail Brown, throwing with the Senior Women placed 3rd in the Discus with 25.55m and good to see her back competing after having to contend with injuries last year. 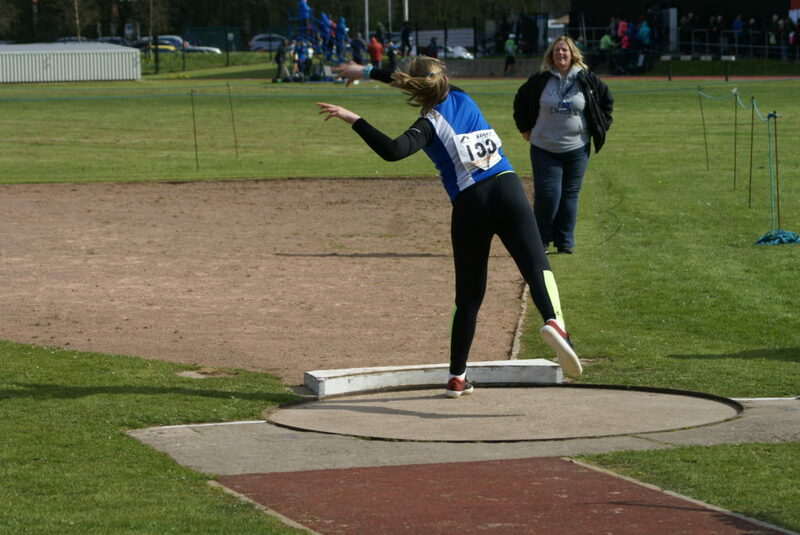 Myah Booth won the U17 Women’s Shot Putt with a distance of 10.65 whilst Millie Coy opened up her season with a throw of 34.59m in 2nd place in the U17 Women’s Javelin after a good competition between her and Megan Howarth of Southport (34.72m). 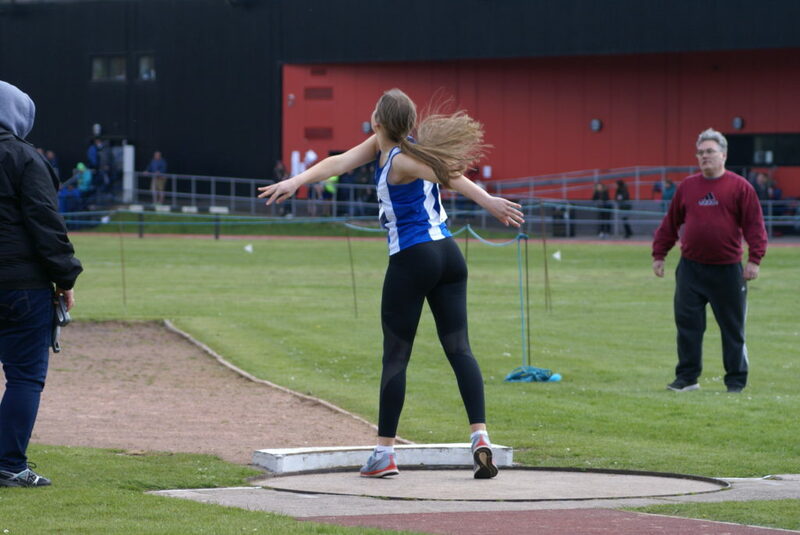 Four girls took part in the U15 Girls Shot Putt featuring 12 athletes – Caroline Woodworth (5th) with a new PB of 6.86m, Grace Bontoft (6th) equaling her personal best of 6.74m, Emily Cottam (9th) with 5.64m and Maiya Elbanna 10th (5.32m). 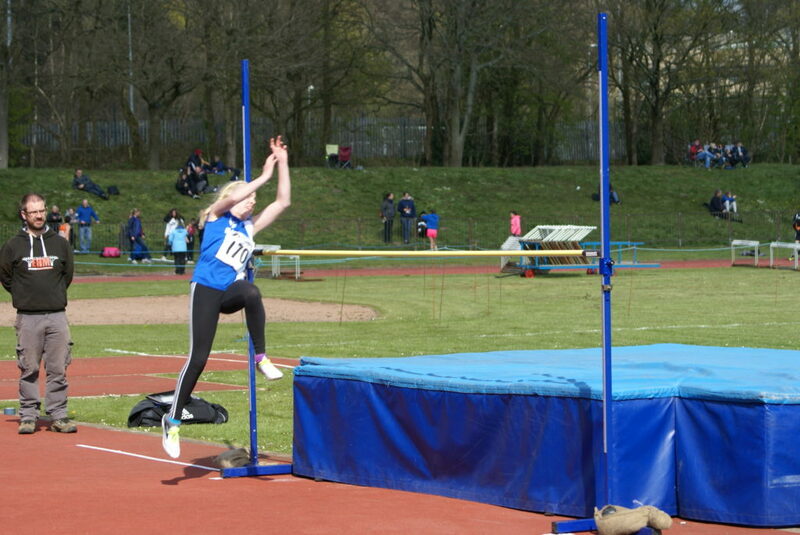 In the U15 Girls Javelin, Caroline finished 2nd with 15.48m, Grace took 4th spot (14.26m) a new PB by two metres as Maiya threw 6.70m in 8th. 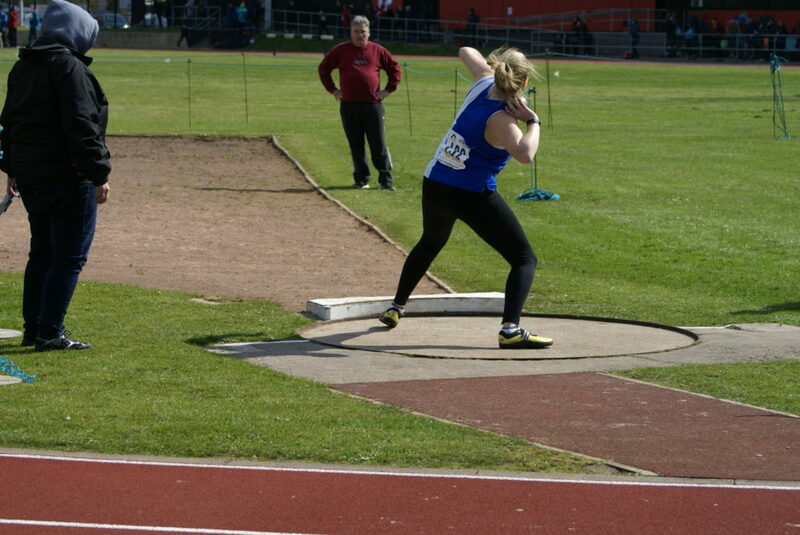 Grace added a good 2nd position in the Hammer with a distance of 26.64m. 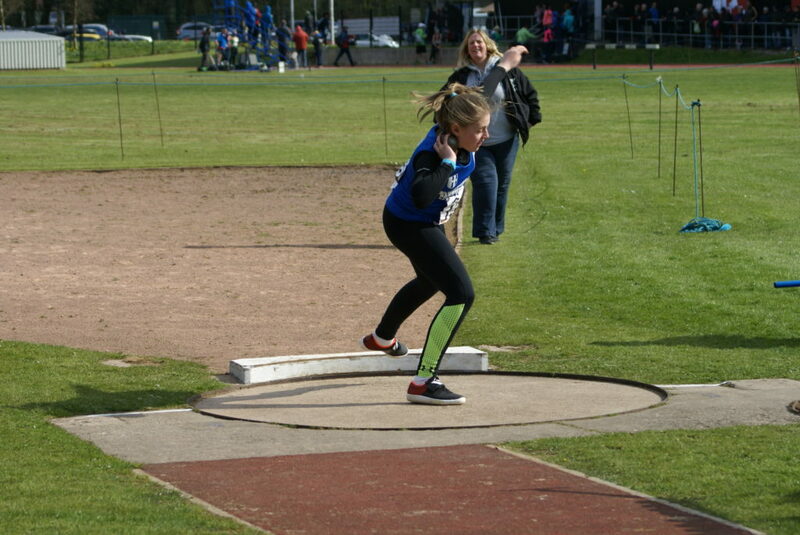 In the U13 Girls Throws – Tilly Pollard and Madison Bontoft had a very good day. 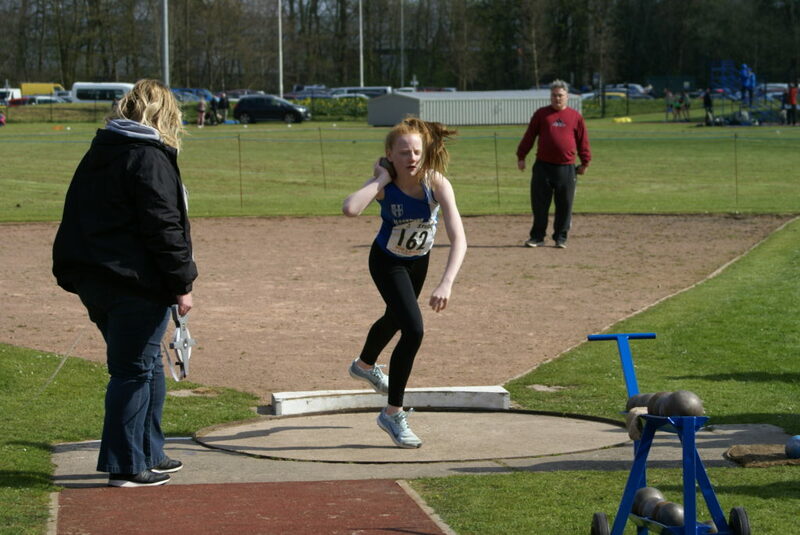 In the Shot Putt it was a 1/2 with Tilly winning with 8.06m and a new PB by a metre and a half, and won the Discus with a massive new PB by 9 metres with a new PB of 21.52m. 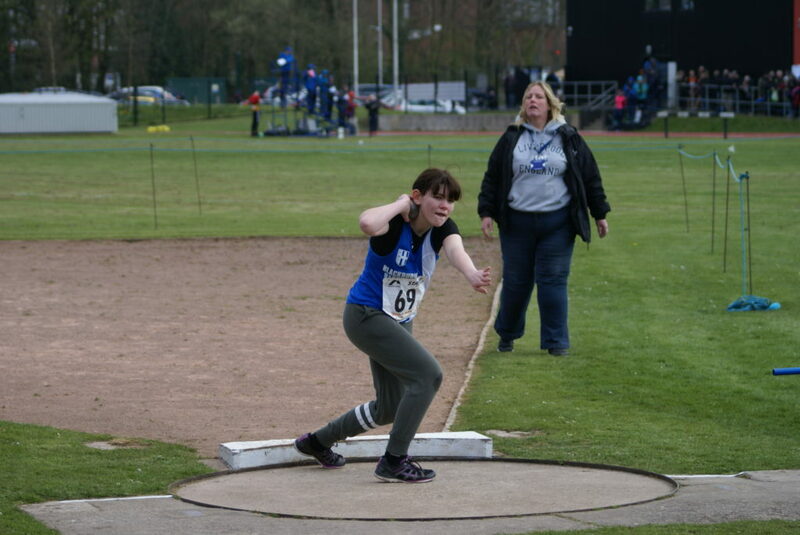 Madison finished 2nd in the Discus with 12.47m and just outside her best, came 2nd again in the Shot Putt with 5.94m and won the Javelin with a new PB of 14.79m. 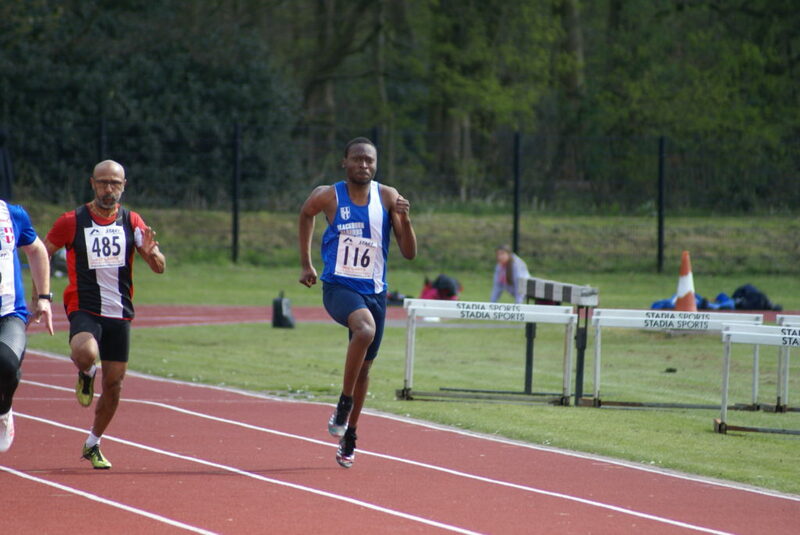 Dominic Bretherton opened up with a win in the Senior Men’s 100m (12.00) with John iLunga – both athletes running in Heat 2 – clocking 12.8 in 4th. 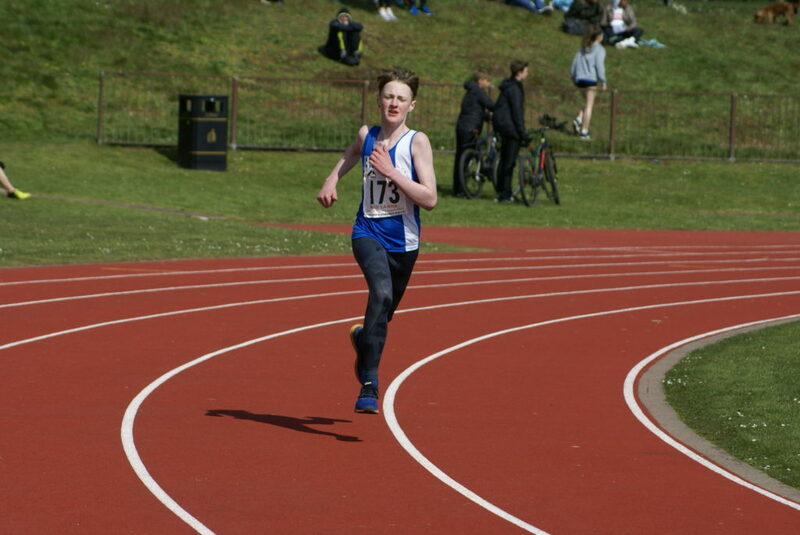 In the U17 Men’s 100m Kyle Mashiter in his first season as an U17 clocked 11.90 in 3rd (Heat 1) with Long Jumper Ben Branton clocking 12.40, also in 3rd (Heat 3). 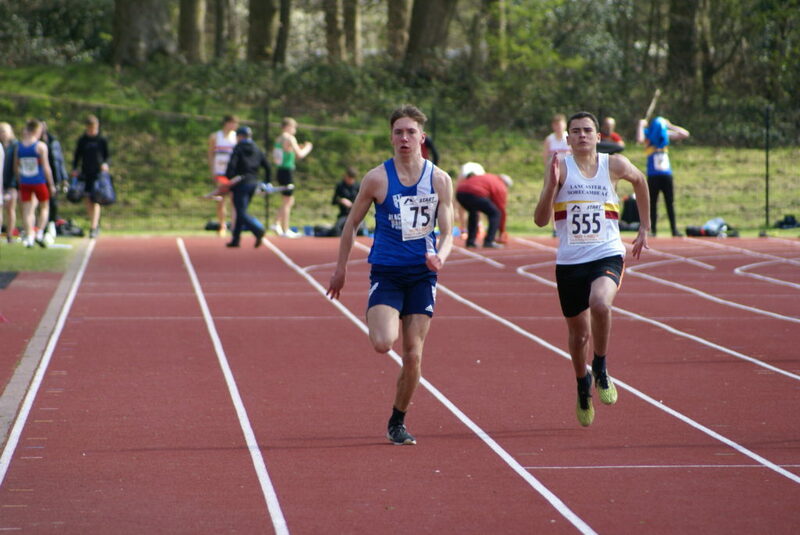 William Dixon had a go at the U17 400m and clocked 75.6 in 3rd place whilst U15 Stephen Alberts had his first ever shot at a 400m coming home in 5th (71.40). 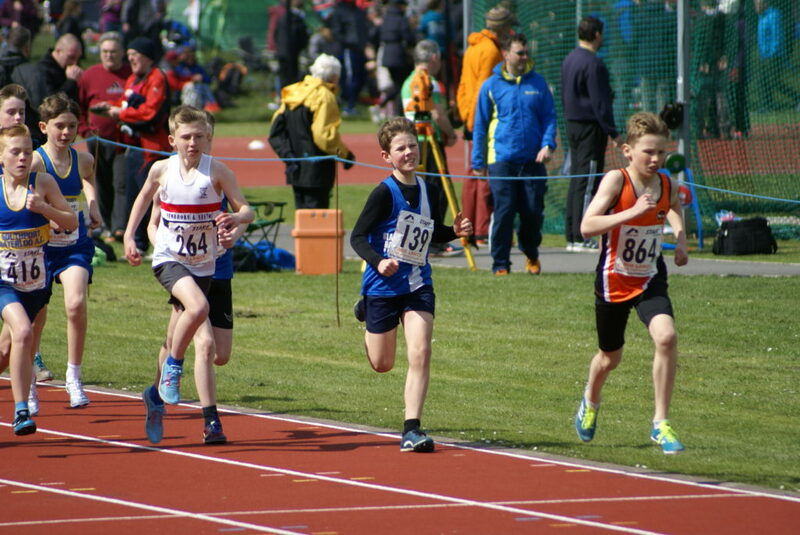 U13 Harrison Allcock came across the line in 13.9, the same time as that given to the winner in the 100m (Heat 1) with Daniel Nuttall making his debut for the Harriers in Heat 2, clocking 14.6 in 5th spot. 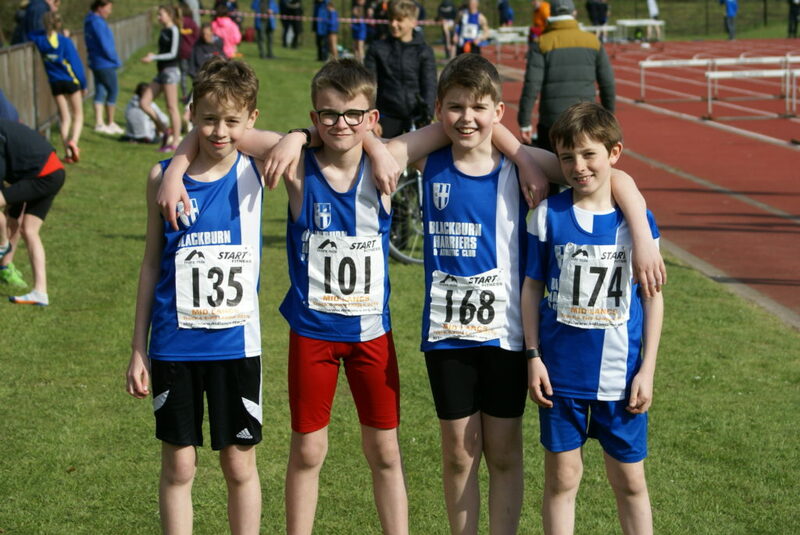 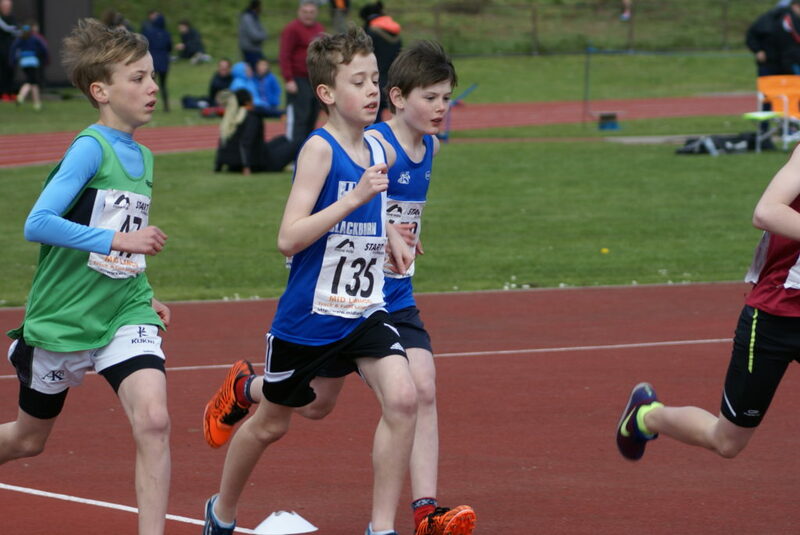 Five U13 lads had a crack at the 200m with Harry Sambrook clocking 31.49 (3rd) in Heat 1, Oliver Gill in his first ever effort over the distance running 33.0 (4th) and Findlay Carroll 35.70 in 5th (Heat 2) whilst in Heat 3 George Ramsden clocked 32.60 in 2nd position in his first ever attempt at the distance with Isaac Smith in 6th place (39.00). 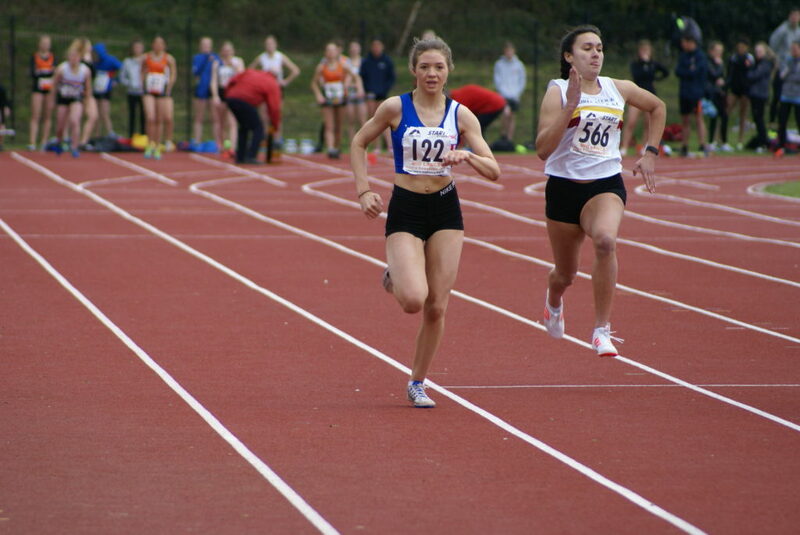 Chloe Bleeks ran 14.30 in Heat 2 of the Senior Women’s 100m (14.30) and 30.1 (2nd) in the 200m. 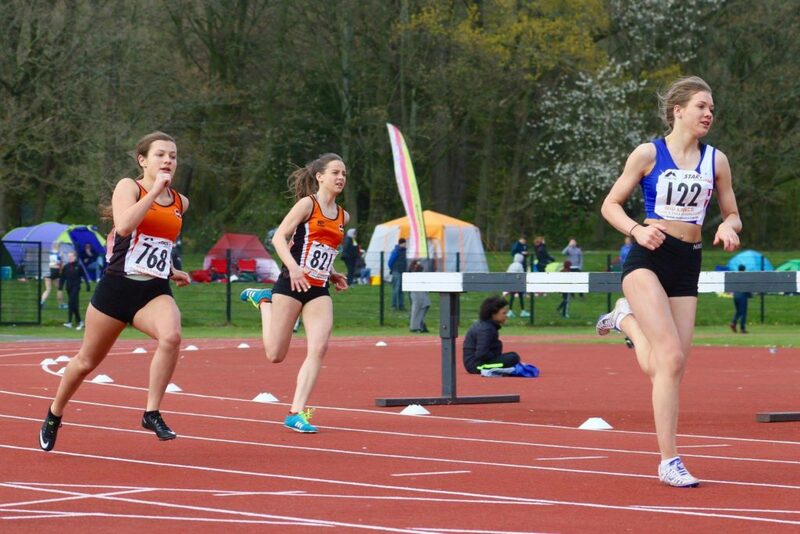 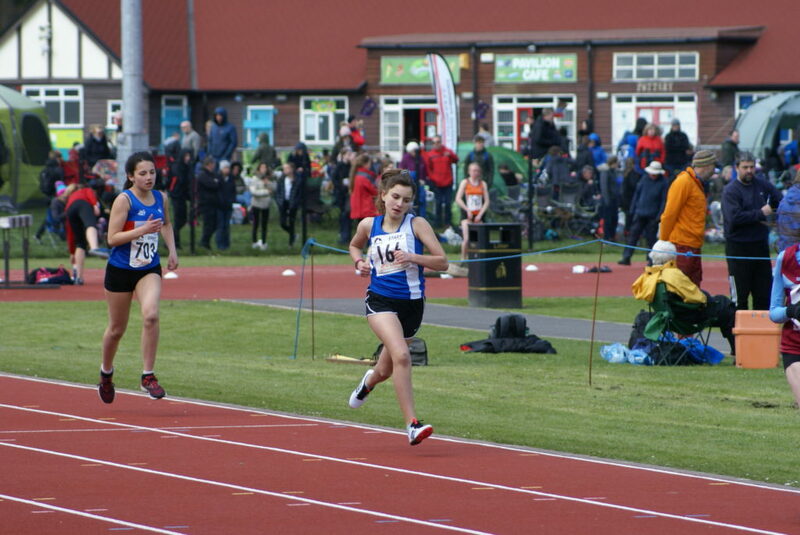 The U17 Women’s 100m had four Heats with Blackburn Harriers featuring in all of them. 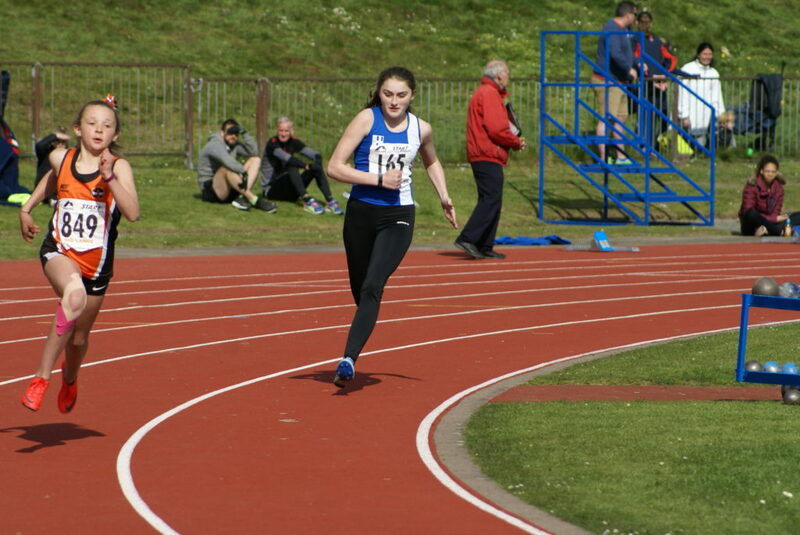 Bailey Madden was first up with a time of 12.80 (3rd) in Heat 1, Amy Wiggans also 3rd in Heat 2 in 13.8, Imogen Mansfield 4th in Heat 3 clocking 13.6 and Abigail Armas 6th in Heat 4 with a time of 14.2. 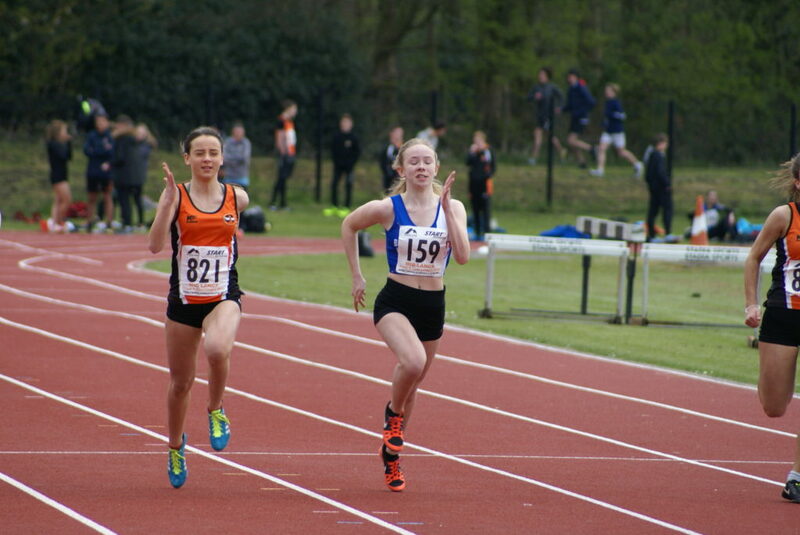 Bailey then went on to win the 200m Heat 1 with a time of 27.00 as Amy placed 5th in Heat 2 (30.2). 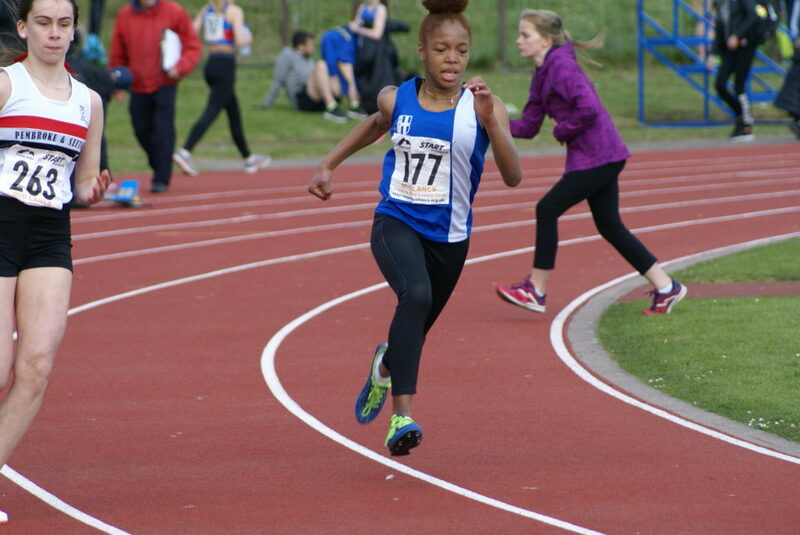 Making her debut for the Harriers in the U15 Girls 200m was Rachael Jesse who had a good start to her competitive career, clocking 29.60 (4th) into the wind. 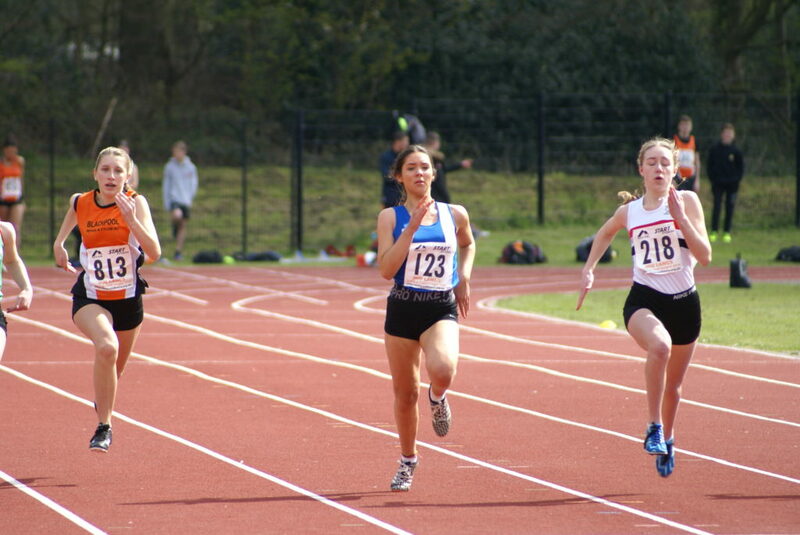 Amelia Burton came home in 3rd spot in Heat 1 of the U13 Girls 100m in 14.3 which was a new PB by over half a second. 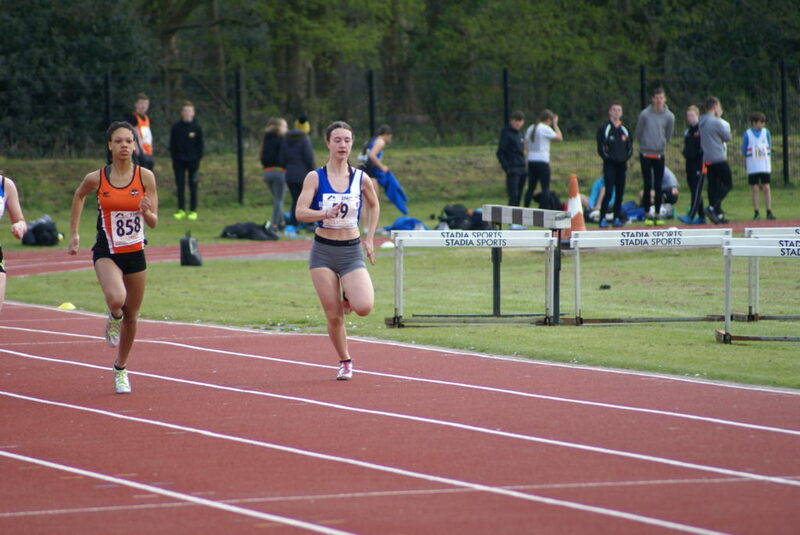 Alisha Lehner ran 15.3 in 5th spot (Heat 2) with Alesha Hindle clocking 16.2 (8th) in the same Heat, both running the distance for the first time. 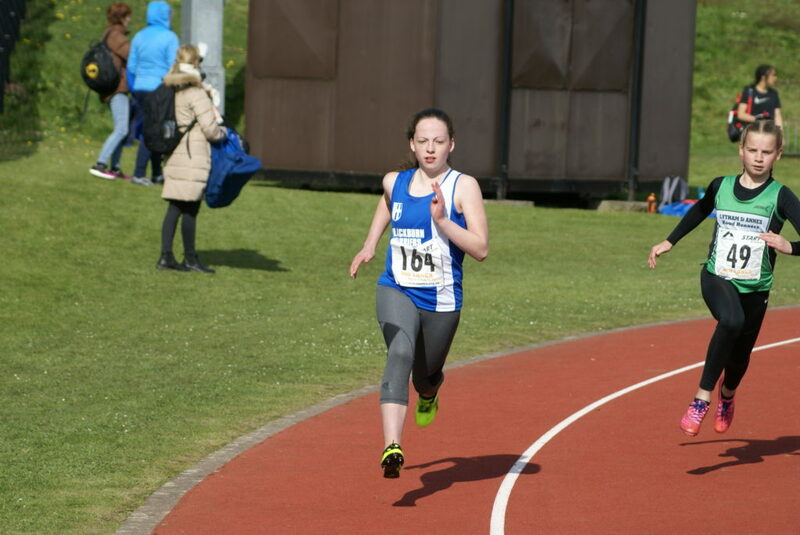 New members Layla Osborn and Sophie Gibson ran in their first ever 100m races with Sophie winning Heat 4 in a time of 14.60 and Layla placing 4th in 15.60 (Heat 3). 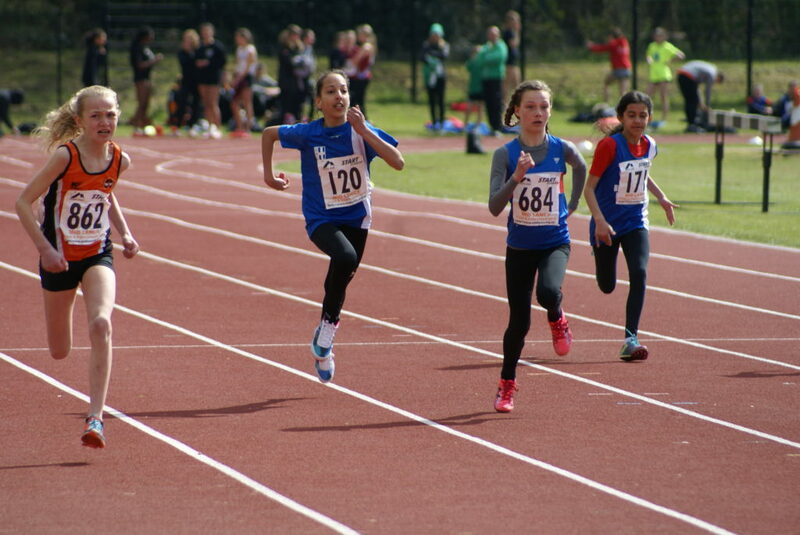 In the U13 Girls 200m Amelia set another new PB of 30.8 in 2nd place (Heat 1) with Sophie clocking 33.90 in Heat 2 (6th) and Layla 35.0 in Heat 3 (4th). 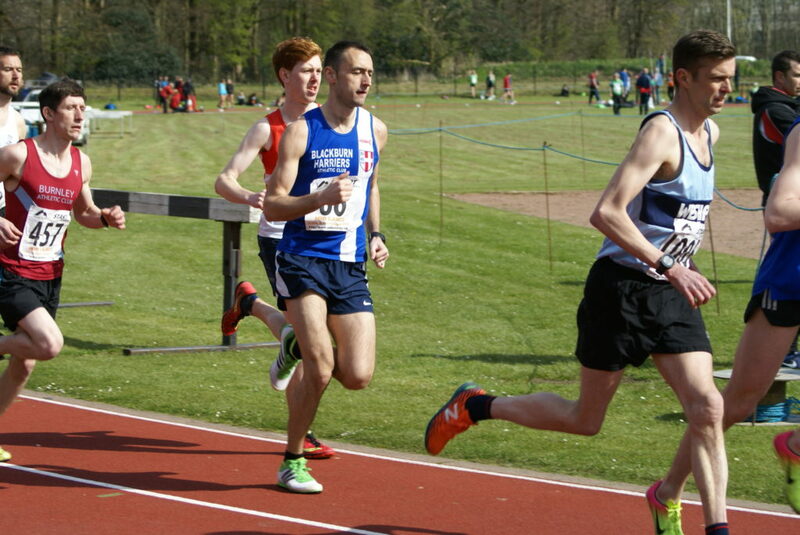 Marc Hartley opened up his track season with an 800m and lead into the wind throughout the first 400m and into the 2nd lap, finishing up with a time of 2.07.5 as Danny Collinge clocked 2.12 in 6th. 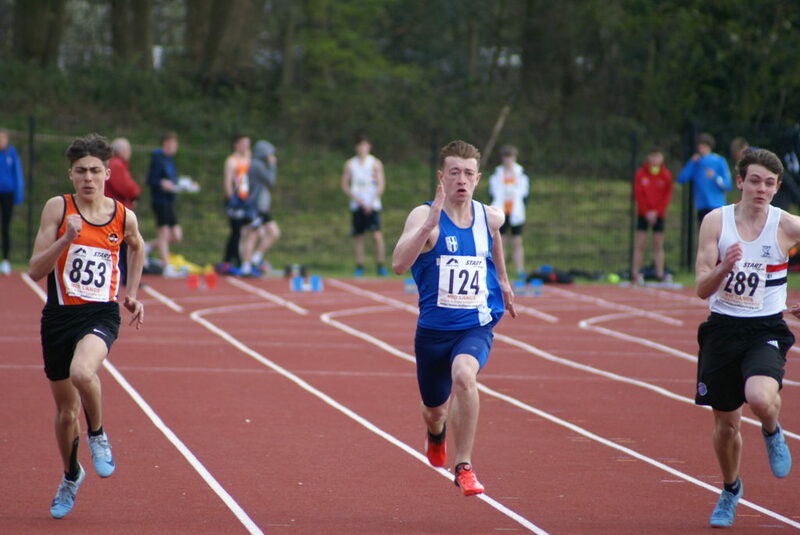 Tom Blaney who has a personal best of 4.29.8 for the 1500m decided to try it out again, and finished really well to knock a huge seven seconds off his time and set a new PB of 4.22.9 in 2nd place with Danny Collinge in 6th (4.43.8). 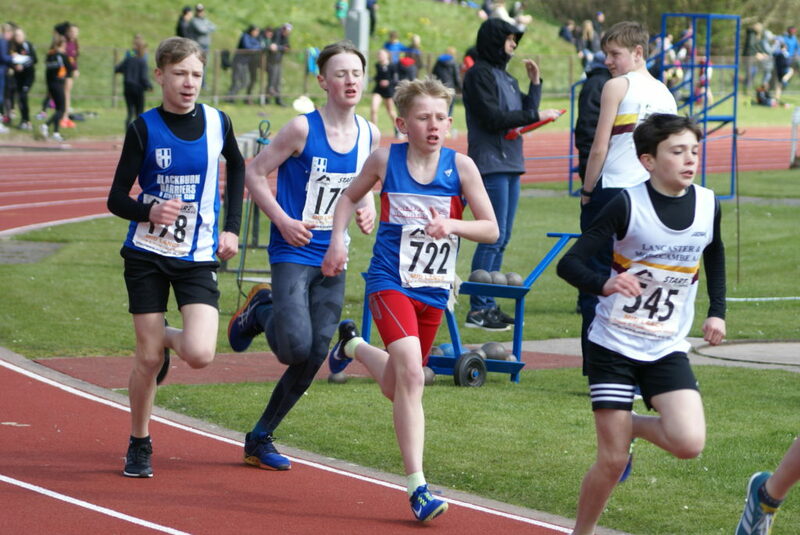 The 3000m had a surpsiingly big field for the Mid Lancs with 13 Senior athletes and two U17 Men included in the biggest field seen in this event for quite a while.The wind made it very diffcult for athletes to attack personal bests, but that didn’t stop U17 Matt Ramsden taking the race to them all and leading from the off with a pretty fast first lap of 67. 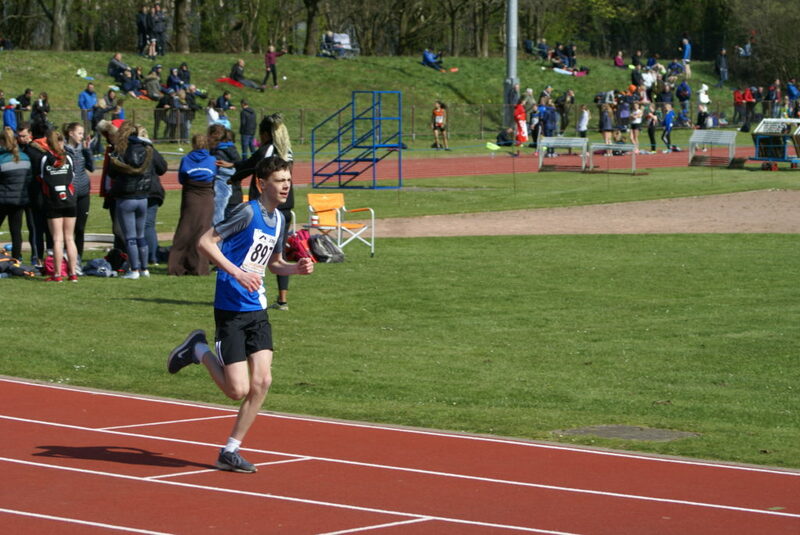 Averaging 72 second laps overall, Matt finished 1st over all and 1st U17 in a very good time of 9.01.6. 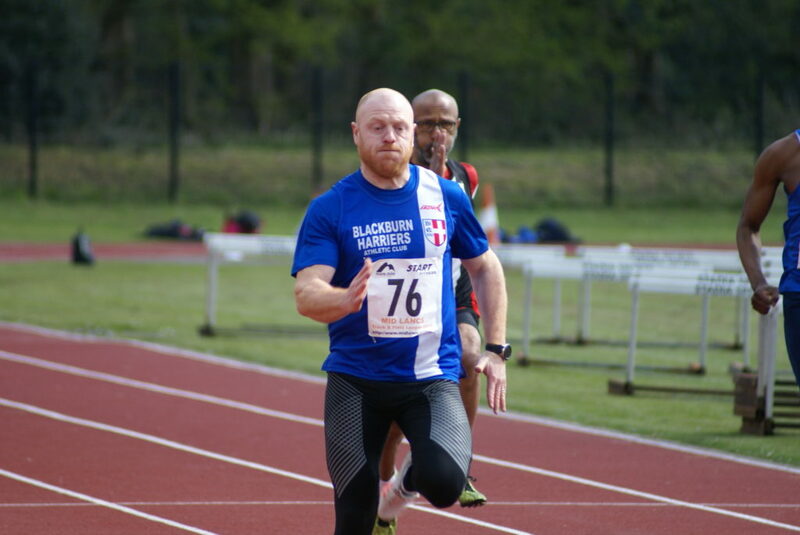 Karl Billington worked his way through the field to clock 9.25.4 in 2nd followed by Tom Blaney in 3rd (9.30.5) which represented another massive new PB by twenty nine seconds, with Chris Davies in 5th in a time of 9.35.2. 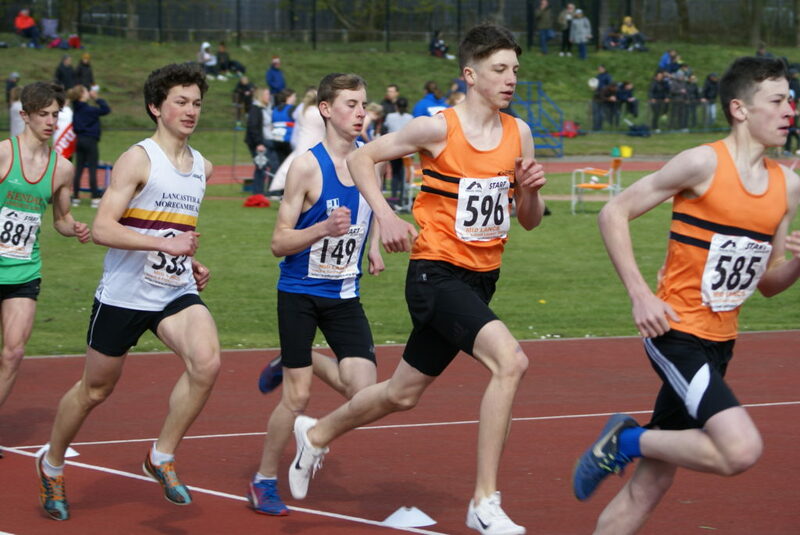 Jamie Teare had a very solid race in the U17 Men’s 1500m as he clocked 4.40.7 in 8th place. 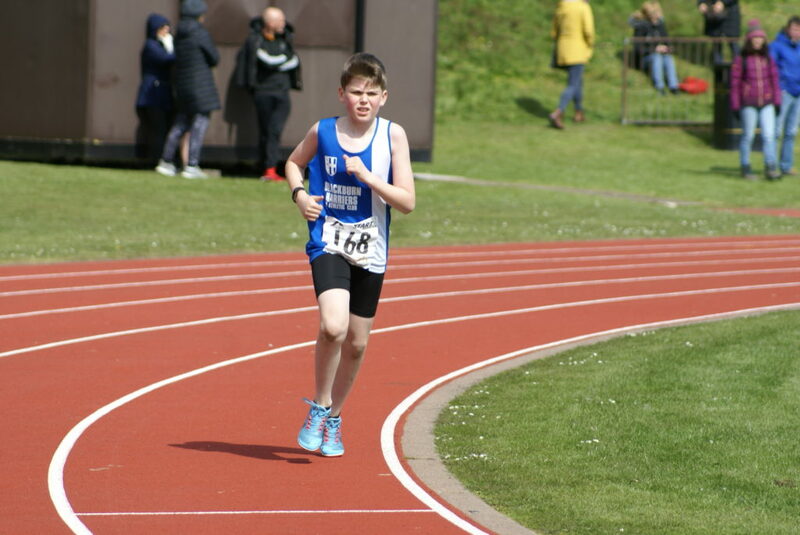 Tom Brooks was running his first ever track race for the Harriers in the U15 Boys 800m and came home in 7th place with 2.31.8 as Stephen Alberts ran 2.35.6 in 10th. 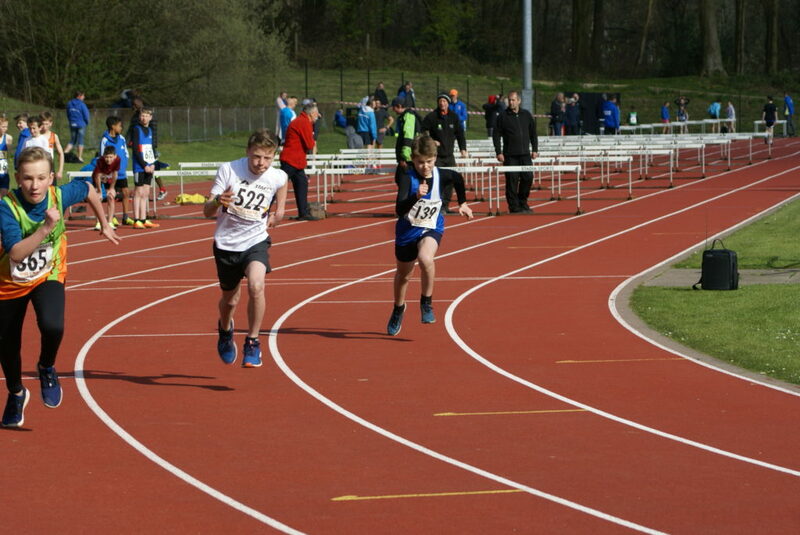 Delighted to see a new PB for U13 Harry Sambrook in the 800m by six seconds as he clocked 2.40.1 in 7th (Heat 1) as Isaac Smith ran a time of 3.28.3 in 7th (Heat 2). 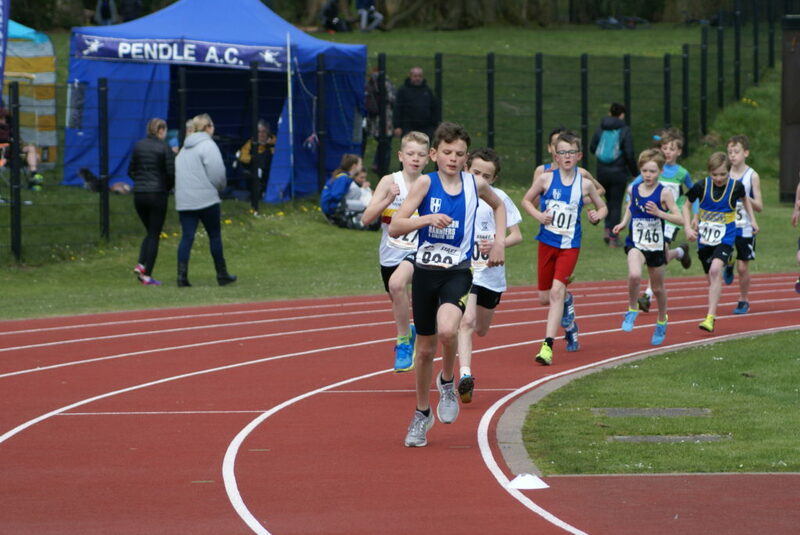 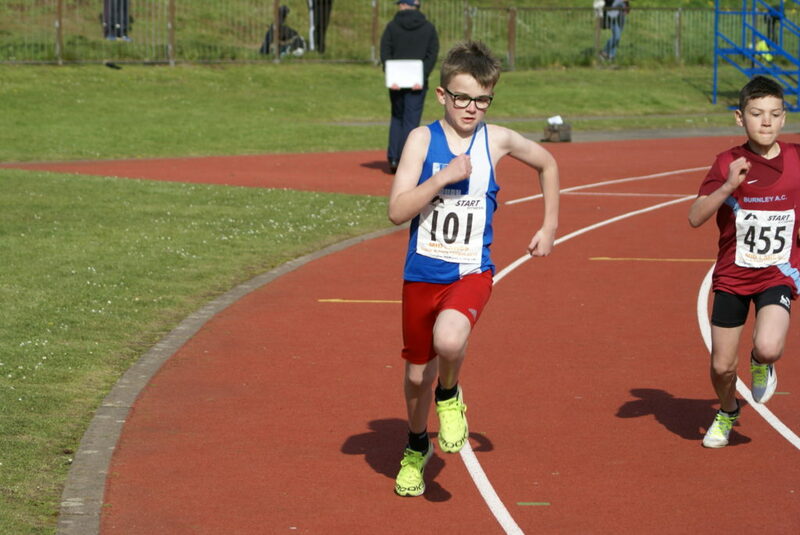 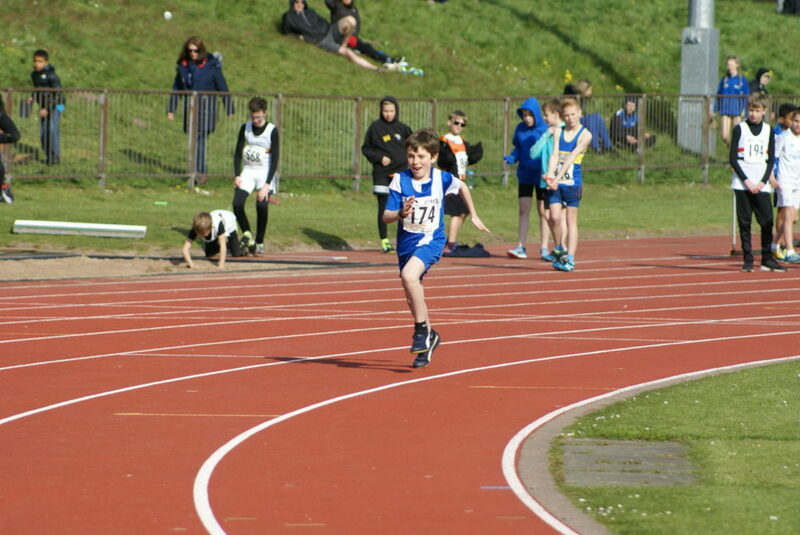 Ben Stratton set off in the U13 Boys 1500m with real intent leading all the way and taking the wind for an impressive win in 5.08.1 with Oliver Gill in 4th place (5.27.2) and a new PB with George Ramsden in 10th (5.53.6) – a first attempt at the distance. 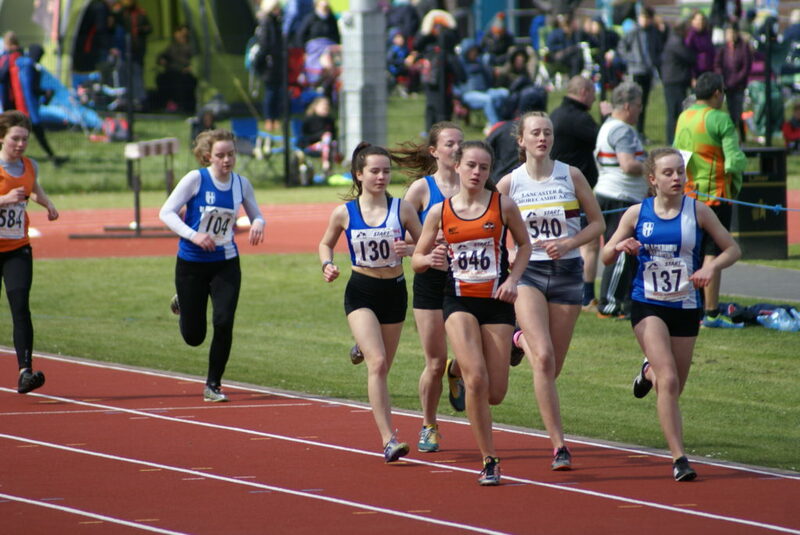 Three U17 Women in the 800m with Hollie Oldham first across the line in 2.40.9 (4th), Rebecca Ramsden in 5th (2.44.2) and Ella Hardman in 8th place with a time of 2.56.3 which was a new PB by 5 seconds. 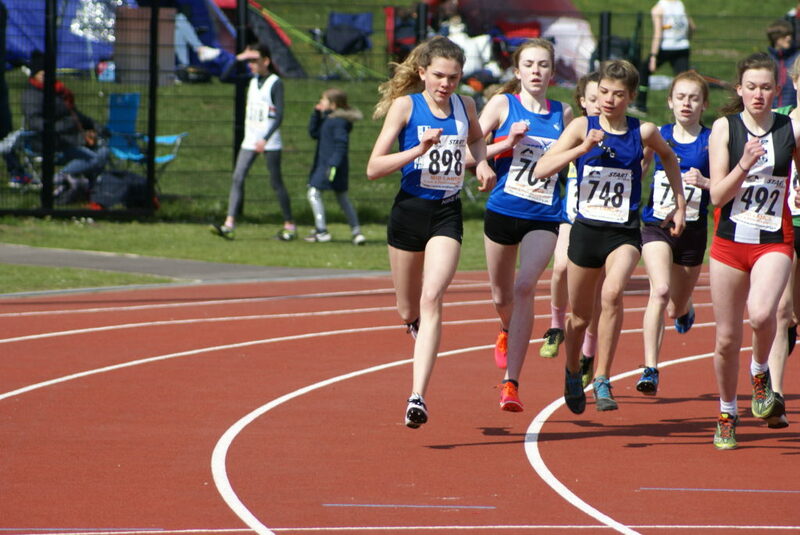 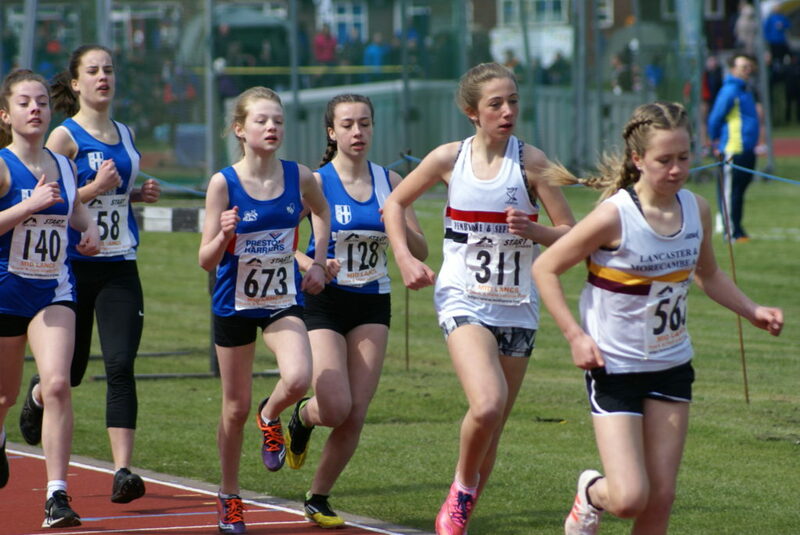 Four Harriers went in the U15 Girls 800m faturing fourteen athlertes which saw Caroline Woodworth the first one of them home in 6th (2.51.7), Eleanor Allsop in 7th (2.53.1), Millie Sambrook (2.55.8) in 10th and Molly Nicholls in 11th (3.00.1). 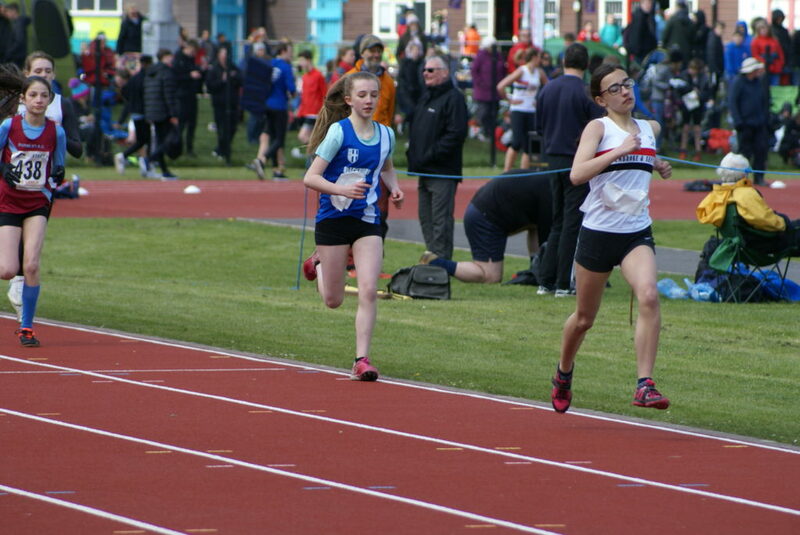 Abigail Stratton ran a very good race in the U15 Girls 1500m to set a new PB by two seconds of 5.05.8 in 2nd place. 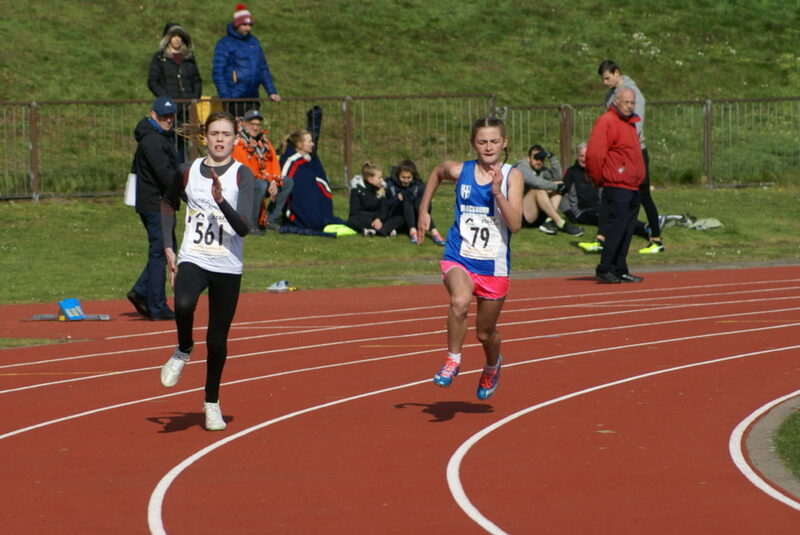 Eve Coulson and Faith Gillibrand ran the U13 Girls 800m with Eve coming home 4th out of the 12 athletes in a debut time of 2.54.0 and Faith placing 8th in 2.58.3. 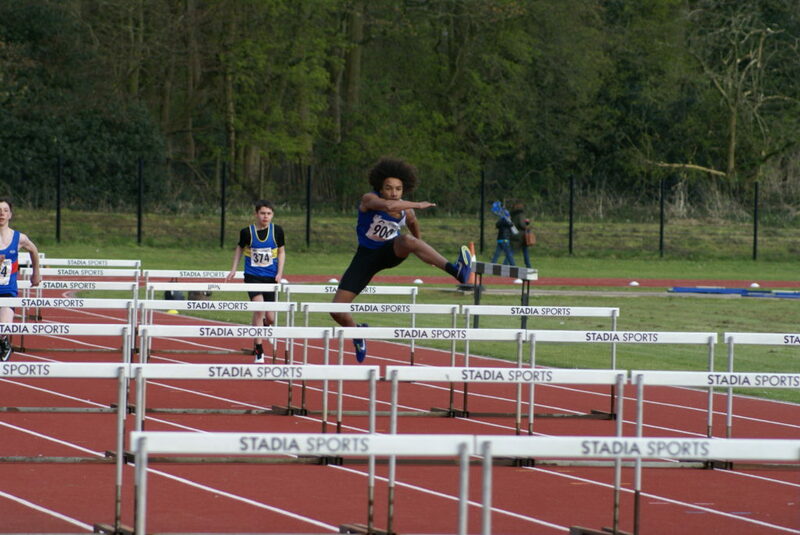 One of the highlights of the day was seeing Jayden Riley run an English Schools qualifying time of 12.00 in winning the U15 Boys 80m Hurdles – the first time he has raced over this distance – and he was followed by Ben Boocock also setting a new PB by just three hundreths a she finished 2nd in 12.3. 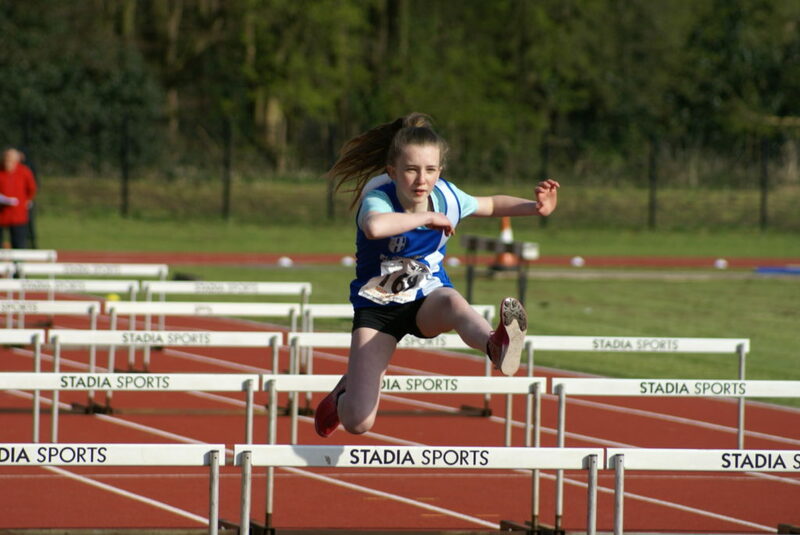 Amelia Burton and Eve Coulsen both attempted the the U13 Girls 70m Hurdles for the very first time with Amelia placing 2nd in 13.7 and Eve 5th in 17.7. 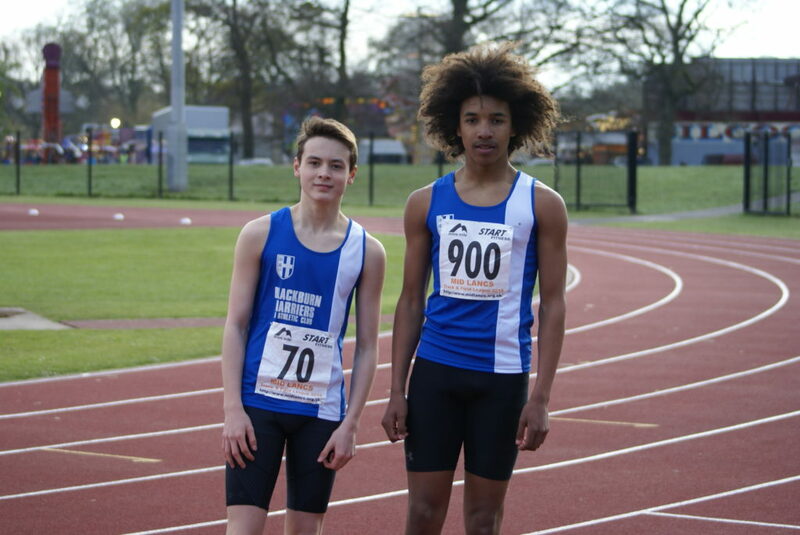 Ben Branton took a solid 2nd place in the U17 Men’s Long Jump which was a good start to his season with a leap of 5.64m alongside Jonathan Gough, also with his first competition of the season jumping 5.51m in 5th spot. 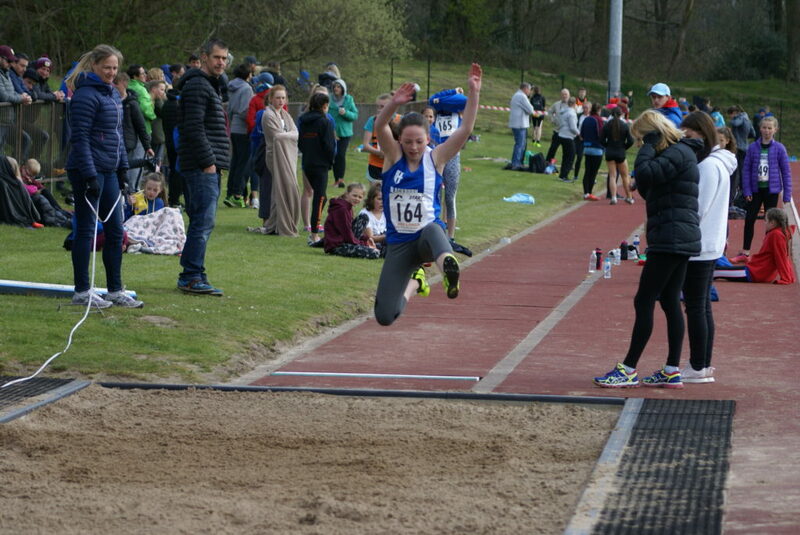 Danny Collinge took 3rd spot in the Senior Men’s Long Jump (4.94m) and Chloe Bleeks leapt 4.27m in the Senior Women’s Long Jump (3rd). 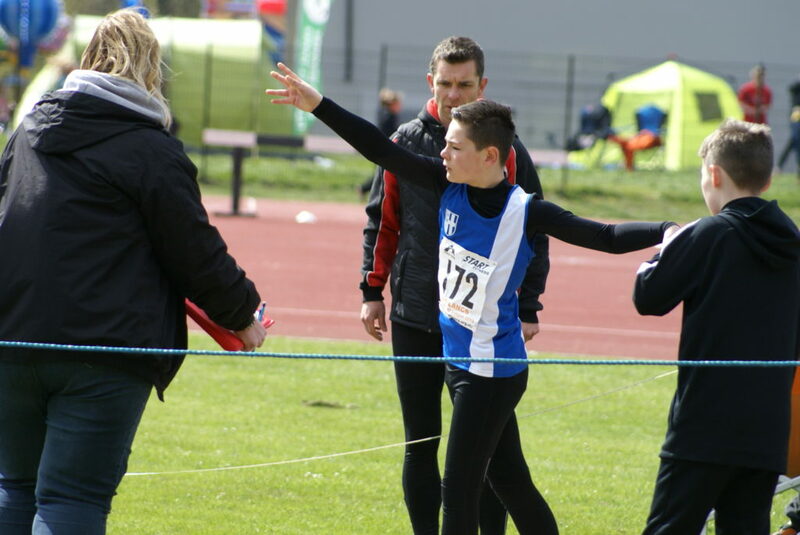 In the U17 Men’s Triple Jump, Jonathan Gough had a very good opener with a 2nd placed leap of 12.04m, just 23cm shy of his best. 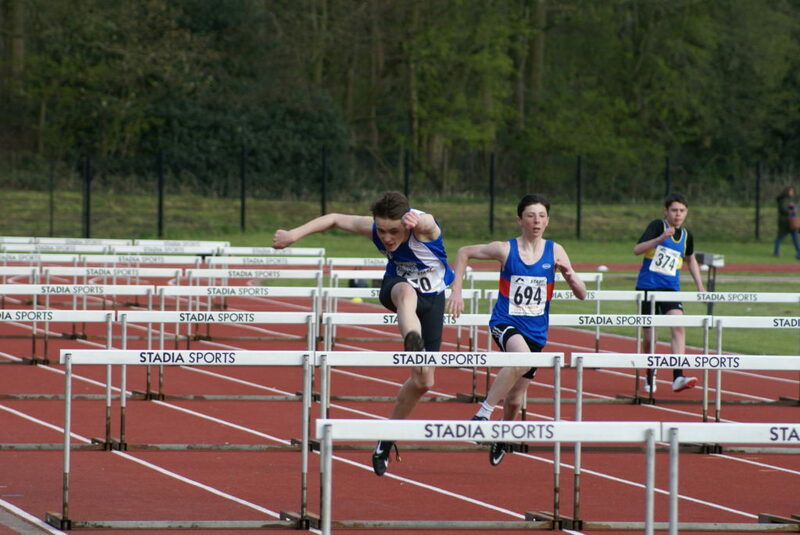 Toby Mansfield jumped 3.17m (16th) and Findlay Carrol (2.68m) in 18th in the U13 Boys Long Jump. 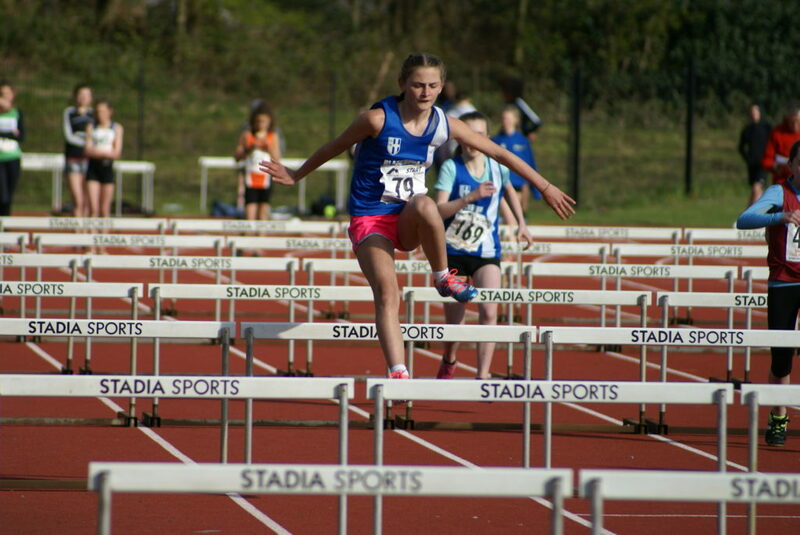 U17 Imogen Mansfield jumped 4.48m in 4th position (U17 Girls LJ) as Skye Greenacre reached 4.13m (8th) in the U15 Girls Long Jump and then cleared 1.30m (7th) in the High Jump. 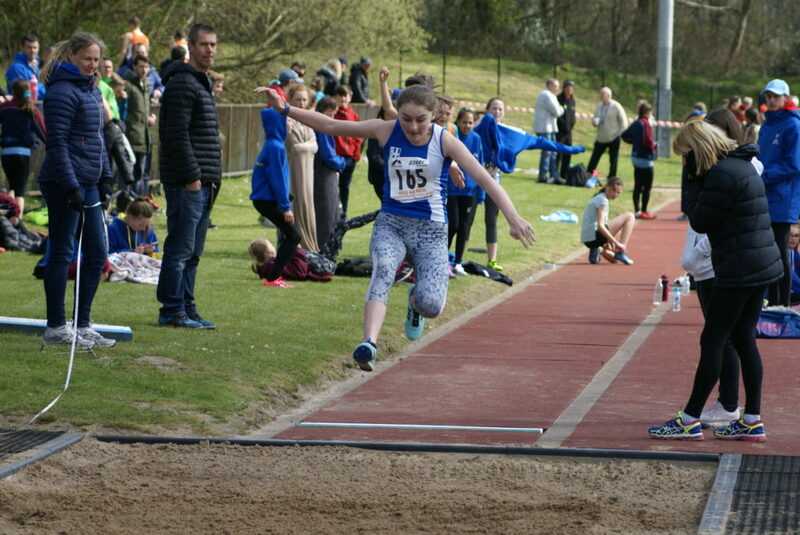 23 Girls took part in the U13 Long Jump with three Harriers among them – Layla Osborn in 17th (3.33m), Sophie Gibson in 19th (3.02m and Alisha Lehner in 21st (2.96m).